I also got the opportunity to go to a presentation today given by an endocrinologist from Case Western on Adrenal Insufficiency. The huge room was full, there was not an empty seat to be found, and I was surprised to not learn a single new thing! They discussed medications and dosing for people with adrenal insufficiency and most of the questions were about changing doses. I guess it's a good thing that nothing was new, if there were new things I didn't know, I think I would be a little upset that I didn't know that before. Overall, it was a good two days. 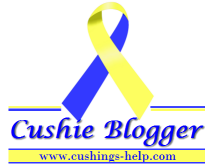 I'm so glad we can help a lot of doctors that have Cushing's patients (a lot of them said it was their first!) and give them information to take home to their patients. I hope tomorrow is just as exciting as the last 2 days!